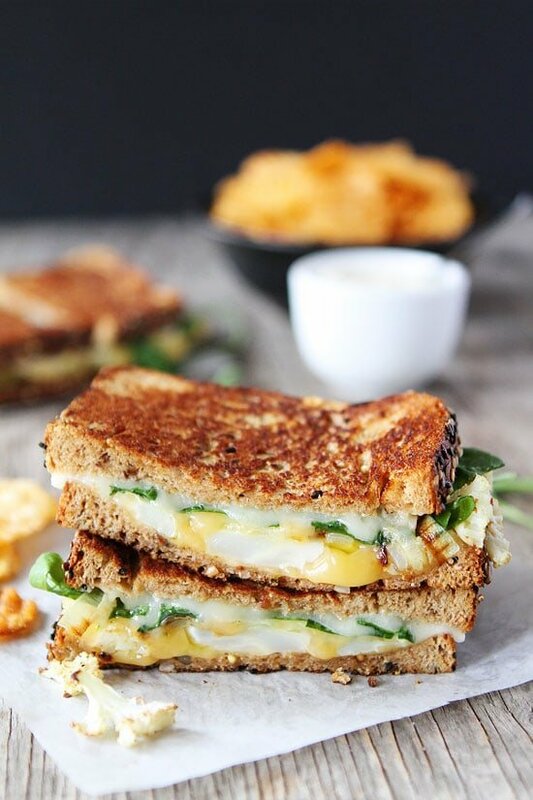 Cauliflower Grilled Cheese – roasted cauliflower, onions, arugula, lemon mustard aioli, Havarti, and Gouda cheese! 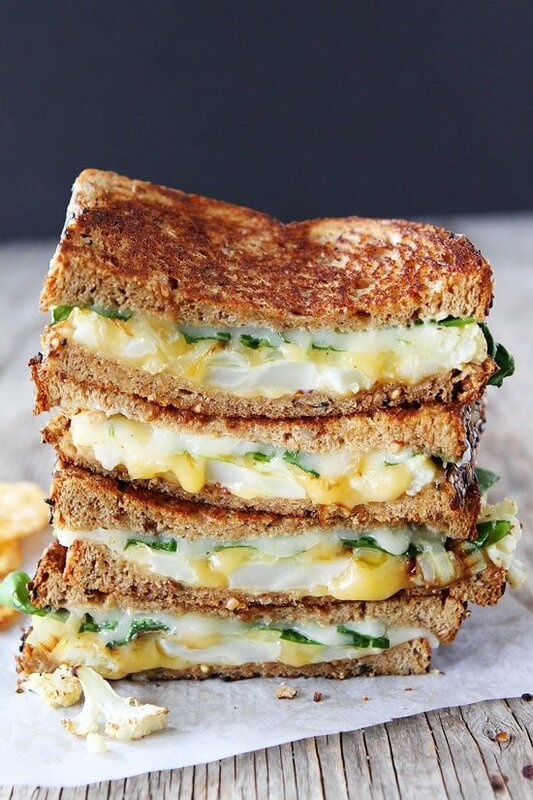 This cauliflower grilled cheese sandwich is out of this world good! 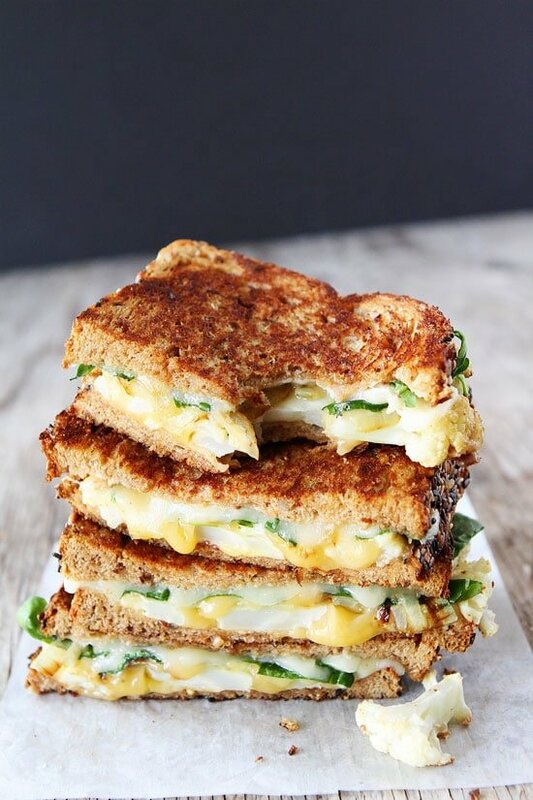 Cauliflower Grilled Cheese? Yes, Please! April is National Grilled Cheese Month and that means April is pretty much the best month ever. I am planning on eating grilled cheese sandwiches all month long. Who is with me? I am starting with this Roasted Cauliflower Grilled Cheese. 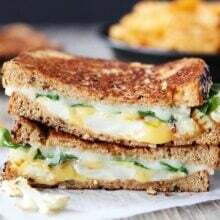 I love a classic grilled cheese sandwich, but I also love trying new and fun grilled cheese recipes. This Roasted Cauliflower Grilled Cheese may sound a little “interesting” at first, but stay with me. Roasted cauliflower, roasted onions, spicy arugula, lemon mustard aioli, creamy Havarti and Gouda cheese, on buttery bread. Are you with me now? Yeah, I thought so. I love everything about this sandwich and I think you will too! Roasted cauliflower is one of my very favorite vegetables, so why not put it in a grilled cheese sandwich? Trust me, it only gets better when it’s sandwiched between crispy, buttery bread and ooey, gooey cheese! I wanted a hearty, whole grain bread so I used Euerka! Organic Bread in Saaa-Wheat. It was the perfect base for all of my cauliflower grilled cheese fixin’s! Try a Cauliflower Grilled Cheese Sandwich! If you are looking for a new grilled cheese sandwich to try this month, I highly recommend my Roasted Cauliflower Grilled Cheese. It is full of flavor and full of cheesy goodness! It is one of my all-time favorite grilled cheese sandwiches…and I’ve made a lot of grilled cheese! You’ve gotta try it! This grilled cheese sandwich with roasted cauliflower, onions, arugula, Havarti, Gouda, and lemon mustard aioli is amazing! You have to try it! Gently toss the cauliflower and onion rounds with olive oil. Place on a large baking sheet and season with salt and black pepper, to taste. 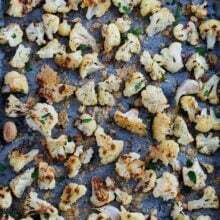 Roast for 20 minutes or until cauliflower is golden brown and tender. Remove from oven and set aside to cool to room temperature. To make the aioli, add the mayonnaise, garlic, mustard, lemon juice to a small bowl. Stir until combined. Season with salt and black pepper, to taste. Butter the outsides of the bread with butter. Spread the insides of the bread slices with aioli. Layer shredded Gouda cheese, roasted cauliflower, onion, sliced Havarti cheese, and arugula. Top with the other slice of bread. Heat a large skillet or griddle pan over medium heat and place the sandwiches butter side down. Cook for 4-6 minutes, or until the cheese starts to melt and the bread is golden brown. Carefully flip the sandwich over and cook for an additional about 3-4 minutes. 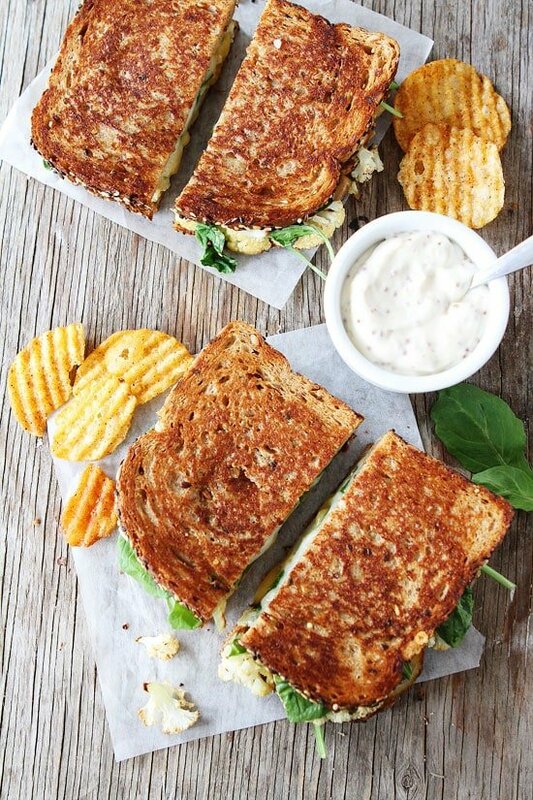 Cut sandwiches in half and serve immediately. This post is in partnership with Arla Dofino, but our opinions are our own. Thank you for supporting the brands that continue to make Two Peas and Their Pod possible. It looks amazing! I’ll cook this for sure!! Gouda is so good! One of my favorites too! 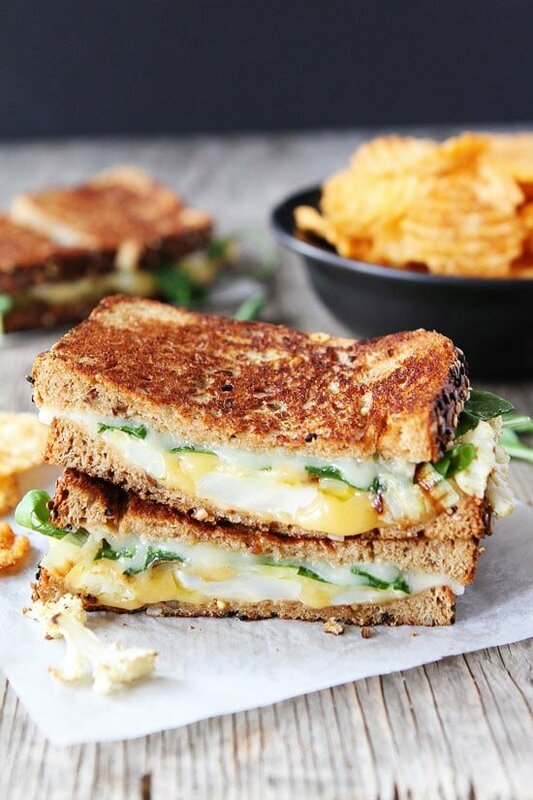 This grilled cheese looks sooo good! I bet the lemon mustard aioli would be good on lots of different sandwiches! 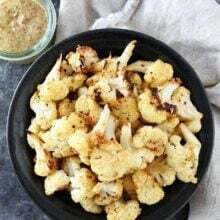 I adore roasted cauliflower and this looks like absolute perfection! Roasted Cauliflower in grilled cheese!! Love this Maria!! Happy Monday!! Oh my gosh – grilled cheese meets my favorite veggie in the world. Love this! Mmmmmm…..I could definitely go for one of these right now! I think this sounds like an incredible grilled cheese. I love cheesy cauliflower and could only imagine how lovely it’d be sandwiched between two crusty bread slices. 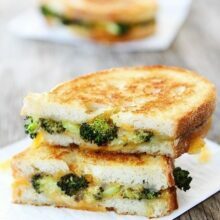 I have been craving grilled cheese and this is a great twist on it! Love how healthy it is! The lemon mustard aioli looks amazing!! Maria- this is so awesome!! I love the roasted cauliflower! Wowza!! What a yummy looking sandwich! Love the sound of a roast cauliflower grilled cheese! Oh my, this looks so delish! I seriously will try this out this spring break! Thanks for the inspiration! Oh, my. This is one out of this world grilled cheese! LOVE. Cauliflower is one of my favorite veggies…add cheese and nommmmm! This sandwich looks so delicious!!! YUM!! I have missed your blog! It’s been a long time since I have been on here! I didn’t now there was such a thing as grilled cheese month, but that’s a celebration I can suport! who would’ve thought to add cauliflower to a sammy?! Such a great idea Maria! Dang! This looks delicious. I didn’t know that April was National Grilled Cheese Month, but any excuse to eat grilled cheese is acceptable for me! YUM! I am so dying to try this, I’m a sucker for cheese. 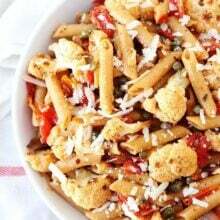 I shared your recipe in my April Real Food Meal Plan. Thanks for posting. this sandwich is delicious. I took the leftover cauliflower florets and put it on top of my spinach salad. What a tasty lunch! Made it. Loved it. I recommend grilling on a cast iron skillet over the stove or over the grill. It melts the cheese better and gives you a better crispy buttery outside. I found a little less than a 1/4 lb of both cheeses sliced from the deli worked great. Will be making again.